I can’t believe I haven’t posted for so long. I’ve been busy as usual. Busy or not I’ve been knitting lots. The potty seat bag was finished but I decided I didn’t care for the top and the way it closed and ripped it out today. 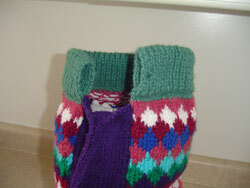 It actually wasn’t difficult to pull out a double hemmed piece like I thought it might be. 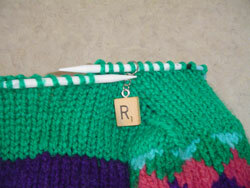 I love this stitch marker – one of 4 that spell F-R-O-G that my aunt Sadie Says gave me for Christmas. 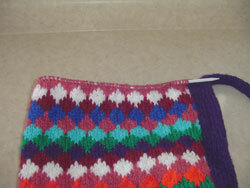 I think my favorite part of the bag is the bottom (well second to the diamond pattern I used in the main part). I hope to finish off the top by the weekend. I am still adjusting to the fact that a new little boy started in my daycare this week. That’s 3 little boys and my 2 girls that I care for. It works out well because I never have more then 4 children in the house at one time. I’m exhausted more from staying up too late play WoW. Yes I’m still playing and I can’t believe how addicted an adult woman can get to these things. 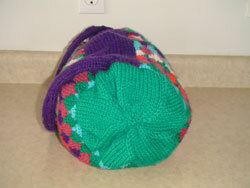 Although I am addicted to knitting so addiction is in the blood. Very pretty! Could you share a picture of the inside? 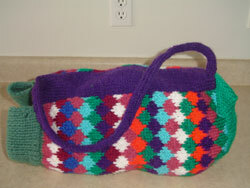 As soon as I re-do the top part of the bag I’ll photograph the inside too.